The Language Academy initially known as the Department of Modern Languages was established in April 2010 at the Johor Bahru Campus and UTM Kuala Lumpur Campus. Language Academy began as the Department of Modern Languages and was one of the departments under the Faculty of Management and Human Resource Development. Communication and Digital Culture is the first master’s taught course program offered by Language Academy. The Master of Language in Communication and Digital Culture adds to the vibrant research community at Language Academy. communication with an emphasis on the emerging modes of communication. The programme’s research and curriculum is not limited to the study of English and the Malay language but extends to other global languages such as Arabic, Japanese, Mandarin and French. contributing to human capital development and the nation’s progress. Possess a Bachelor’s Degree other than Language and Communication and at least two years’ experience in the relevant field recognized by the University’s Senate. International applicants need to have an English Language proficiency level equivalent IELTS 6.0 / TOEFL 550. The courses are categorised into four (4) groups: University, Faculty Core, Program Core and Elective. There are two types of core courses that registered students are required to take under this program. At least two of the core courses are offered every semester and students are advised to register for the core courses to ensure that they are able to complete the program within the required time. 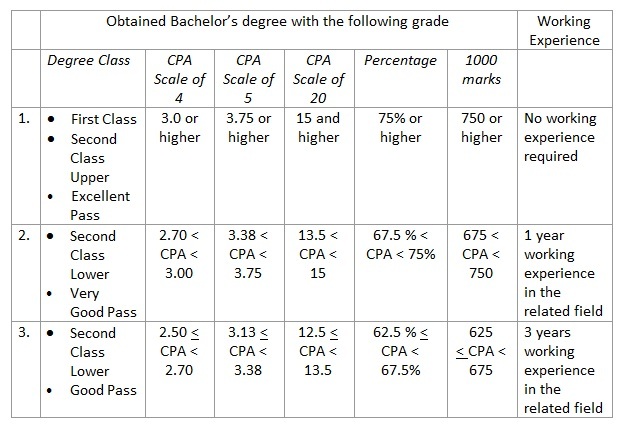 Apart from the core courses, students are also required to complete four (4) elective courses. There is a total of 13 elective courses under the MLCDC program. Elective courses also fall under two different pathways: i) Language and Communication (code: MLAC – e.g. MLAC2153 Multimodal Discourse) and ii) Language Education (Code: MLAE – e.g. MLAE1123 Language Learning Theories). Students who have an interest in the Communication pathway are advised to take electives under this pathway. For the award of Master of Language in Communication and Digital Culture, the students should achieve a total minimum of 42 credit hours including completion of Master Project. Students will be awarded Master of Language in Communication and Digital Culture upon completion of this program. The course comprises discussions on the fundamentals of qualitative research in language and communication. Students are given exposure to different research paradigms and various theoretical orientations. Methodological approaches in qualitative research will be discussed leading to developing qualitative research designs based on students’ research interests. This course will enable students to identify and apply appropriate methodologies in order to design and develop qualitative research instruments and analyse qualitative data for language and communication research. The aims of this course are to provide students with the opportunity to assess quantitative research methods that are used in social science studies for the purpose of applying these methods in their own research. This course will begin by examining situations in which quantitative research methods will be more useful in arriving at more significant findings. Students will be required to distinguish key statistical terms and central statistical concepts of descriptive statistics and inferential statistical analysis methods. In addition, the course will outline the application of statistical analysis in handling, analyzing and interpreting data obtained for quantitative language and communication studies. At the end the course, students should be able to apply these statistical procedures to interpret the data collected from their own research. The aim of this course is to expose students to the key theories, concepts and practices of language and communication. In this course, the theories and concepts of language use in various types of communication will be critically reviewed. Students will be required to analyse the practices and current issues of language and communication. This course will also introduce students to media and digital communication and discuss their implications on society and culture. As part of the assessment, students will be given an opportunity to conduct a small-scale study examining the current issues of language and communication practices in different cultural settings. This course is dedicated to the analysis of digital cultures or cyber cultures that is the social relationships that occur in the realm of new media like the Internet, video games, smartphones and other high-tech tools. Hence, this course will be more theoretically driven as students will be exposed to the major concepts and methods to study issues in digital cultures and the related inter-disciplines, such as ethnic, cultural and women’s studies. The course is structured along two overlapping paradigms: i) key concepts (e.g. culture, ethnicity, hegemony, gender, sexuality and imperialism); and ii) various elaborated theoretical positions; race/ethnic theories, feminisms, post-structuralisms, and post-colonial theories. At the beginning of the course, students will have the opportunity to explore how the “digital” is impacting on society and changing our culture. 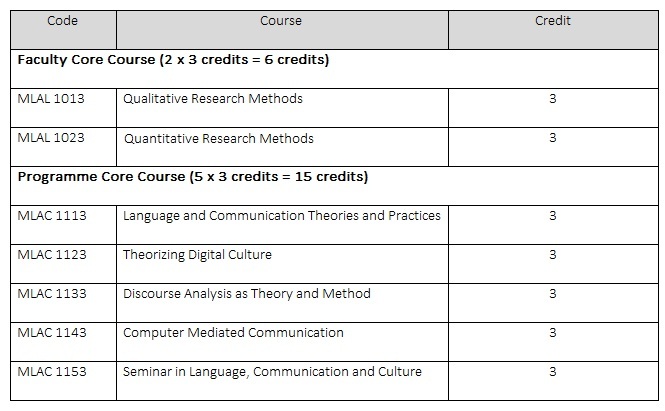 In the second half of the course, questions about theory and method will be grounded via a critical analysis of current issues in the digital culture as well as an examination. At the end of the course, students will have a thorough knowledge of the major theories which will lay the groundwork for further research work. This course provides overview of theories and applications of technology in disseminating information with relevance to the fundamental concepts of CMC. Established and emerging modalities of computer mediated communication and mediums will be explored to further understand how human-to-human communication interactions have been influenced or altered through the use of computer technology. Using computer technology as a tool for communication, students will discuss and review critically issues on CMC from both research and practical perspectives. In this course, students will examine key issues related to the intersection between language and culture. Students will be required to review and engage in an academic forum discussing a range of current research in the study of language, linguistics and culture. In addition, students will gain experience from conducting a small-scale research project as part of the assessment in this course which provides practical training for students who intend to carry out research in the area of language, linguistics and culture. This course will focus on the management, strategic planning, and implementation of communication techniques to resolve corporate dilemmas. Topics reviewed in this course will include Communications theory; organizational behaviour; human and public relations management; and professional ethics. In addition, with the digital media revolution which has created new corporate challenges, this course will require students to examine how organisations have adapted to latest trend, create value and relationships with offline and online stakeholders. At the end of the course, students will be required to examine the use of emerging media in corporate communication via a professional or consultancy project in which they will apply research principles to support academic and professional thinking in the corporate communication. This course will expose students to the theory and research in health and wellness communication by examining the key concepts of health, wellness, illness and disease. At the beginning of the course, students will examine the different analytical approach to the study of health and illness. Students will have the opportunity to evaluate current issues in health communication with a particular focus on the growing trends of promotion, health care and information delivery via a broad range of e-health applications (e.g. health websites, health blogs, YouTube videos, health care system portals and mobile health applications). As part of the assessment, students will be required to critically assess current research in health communication and conduct a case study in which they will select and analyse data on health in different domains. At the end of the course, students should be able to design and conduct a small-scale research examining current health and wellness-related communication issues. This course will discuss the key concepts and theories in the study of media and digital communication with an emphasis on the media’s a pivotal role in the globalisation process. Students will examine a range of topic in traditional and new media including the process that lies behind news production, the role of news values, and news stories as ideology. 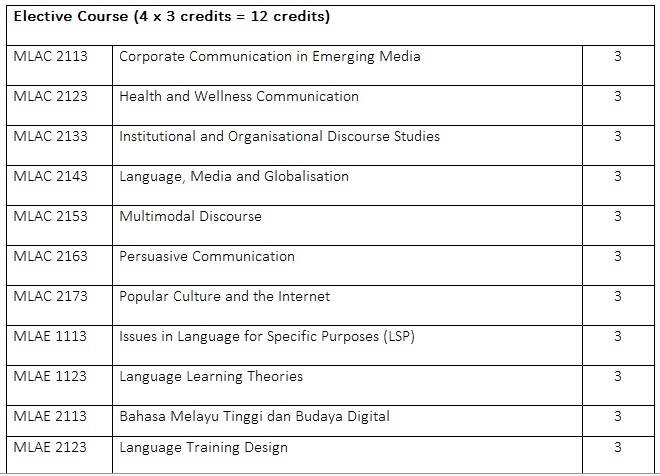 In addition, this course will also focus on the role of media as the agent of globalisation. Students will evaluate specific features, communicative and persuasive elements of traditional and the new media technology. As part of the assessment, students will examine different media sites as potential areas of research. At the end of the course, students should be able to critically assess data from both the traditional and new media and the impact they have on global communication. This course introduces students to the concepts of multimodality, which deal with different modes of meaning making. The discussion of the course will start off with the application of metafunctions of Systemic functional linguistic theory by Halliday to the theories of multimodality. The focus will be on eliciting the ways in which the three metafunctions, representation, interpersonal and textual, can be used to construe meanings. In addition, students will be exposed to the issues of text-image relations, visual modality concepts, visual metaphors and multimodal discourse, which play a significant role in social semiotics. At the end of the course, students are given an opportunity to conduct a small scale multimodal study as a means of applying the knowledge they would have gained through the course. This course will examine the various theories and models that underpin the study of persuasion. Students will identify and analyse the use of persuasive language and devices as well as other elements for example culture, logic and motivation. This course will require students to critically evaluate persuasive language and strategies in a variety of contexts (e.g. campaigns and advertisements) in both the conventional and digital media. At the end of the course, students should be able to demonstrate their understanding of persuasive communication and its key elements and the different contexts and modes in which persuasion can be found. The internet has grown from a fringe cultural phenomenon to a significant catalyst for cultural transformation. In this course, students will explore the relationship of popular culture and the Internet. It covers the discussion of apps, trends, and research in popular culture and the Internet. At the beginning of the semester, the course introduces the theories related to pop cultures. This is followed by in-depth discussions of specific case studies of popular culture and the Internet. Finally, students will present their experience undergoing a real Internet campaign. At the end of the course, students should be able to have a clear understanding of how popular culture and the internet influences each other. The module aims to expose students to the theories, issues and ongoing developments in Language for Specific Purposes (LSP) and the need for insights into and knowledge about current research in LSP and specialised discourse. The topics that will be covered in this module include issues in LSP research, research methods, assessments and use of information technology in LSP. As part of the assessment, students will be required to read and critically assess current research in LSP and apply knowledge on LSP theories, concepts, practices and research in evaluating a selected LSP course. This course introduces students to theories, issues, and research findings in the areas of first, second, and bilingual language acquisition. Linguistic theories pertaining to the language learning process will be critically reviewed. Factors which influence the success or failure of language learning in naturalistic and, more importantly, in instructed environments will be discussed. Authentic research articles related to language learning will be discussed via instructor- and student-led discussions which will deepen understanding of the literature and enhance critical thinking skills. Kursus ini menumpukan kepada perkembangan, ciri dan penggunaan bahasa Melayu Tinggi atau bahasa Melayu baku. Pendedahan tentang bahasa Melayu Tinggi ini akan memberi peluang kepada pelajar untuk mengetahui tentang aspek-aspek dalam pembakuan bahasa serta mengenal pasti laras dan gaya bahasa Melayu sebagai bahasa wahana ilmu. The course provides students with knowledge of designing professional language training programmes. It covers issues and principles related to syllabus and materials design in professional contexts. Students will be exposed to the innovative integration of digital communication in the training programmes. The course highlights key concepts and practices in setting instructional objectives, planning language training programmes, designing syllabus, and developing training materials. This course prepares students in understanding the concept of professional literacy which involves the concept of community of practice. It covers three domains which include professional literacy in private sectors, in education sectors and in governmental sectors with a particular focus on the influence of digitized communication. At the beginning of the semester, the course introduces the theories related to professional practices to students. In-depth discussions of specific case studies of literacy in the different professional and digital communities are provided throughout the semester. At the end of the course, students should be able to have a clear understanding of professional literacy in the different domains. This course covers key sociolinguistic concepts and topics relevant and useful within different settings. Topics include sociolinguistic analysis for professional setting, workplace culture, workplace communication, leadership and communication, power and communication in the workplace, and language policy and workplace. This course offers theoretical knowledge as well as practical knowledge which will be useful for students to examine and understand language use and it social variables. Students will be introduced to the topics and level of analysis at both macro and micro levels: the broader understanding of language and society as well as the specific aspects of language, communication patterns, and speech behaviours. Such dual-level understanding will allow the students to link the concepts to the real world setting that they choose. The course will give an opportunity for them to embark on a project in order to allow them to apply the knowledge they would have gained through the course. This is an academic exercise for writing a research proposal. Students will be guided to write a research proposal for their Masters project, by which students will conduct a study individually to investigate the language use in different professional settings. Based on the knowledge acquired in the taught courses and supervisor’ guidance, students will identify a topic or research area. They have to write the first three chapters which are introduction, literature review and methodology. The written proposal should strictly adhere to the UTM thesis writing guideline. Although Masters Project I and Masters Project II make a set, they are assessed separately. Students will conduct their study as proposed in Masters Project I, based on the knowledge acquired in the taught courses and supervisor’s guidance. At the end of this student, they will produce a report for the Masters Project which includes introduction, literature review, methodology, findings and discussion, and conclusion chapters. An oral presentation of the project, with the presence of examiners, is compulsory as one of the final assessment besides the written report. The written final report should strictly adhere to the UTM thesis writing guideline. Although Masters Project I and Masters Project II make a set, they are assessed separately. Discussion on this subject includes issues related to globalization and development, economic and social crisis that has become a global concern. It aims in developing skills in understanding and analyzing global issues and recommending relevant solutions. Issues will be discussed in details. This course discusses UTM’s philosophy and the philosophy of knowledge, concepts, goals, history, and the importance of the philosophy of science, the relationship of science and religion, and comparisons between Islam and Western science. This course also discusses the universal view about God, nature and mankind, the role and importance in the formation of culture and civilization, as well as the concept and importance of Maqasid Syariah in science. Also being debated are the issues and challenges of civilizations between the West and the East; development and the environment; economics and law; state administration and management; scientific research; communications and information technology; and family education. This course is intended to encourage students discover and develop their personal leadership qualities. They will be exposed to leadership theories so that they could develop an insight that leadership itself is a dynamic relationship based on mutual influence and common purpose between leaders and followers. Levels of analysis of leadership theory: individual, group and organizational. This course is designed for international postgraduates from countries of non-Malay origins. Students will be exposed to various aspects of the Malaysian culture such as belief system, religious festivals, customs and etiquettes of different ethnic groups in Malaysia. Emphasis will be given to the Malay culture as it makes the core for the Dasar Kebudayaan Kebangsaan. Students will also be briefly introduced to basics of Malay language as the national language of Malaysia. Kursus ini ditawarkan kepada pelajar antarabangsa program Sarjana dan Doktor Falsafah dari rumpun Melayu seperti Indonesia, Brunei, Selatan Thailand dan Melayu-Singapura. Dalam kursus ini pelajar diberi pendedahan tentang penulisan karya ilmiah. Perkara yang menjadi fokus kursus ini adalah aspek ejaan, tanda baca, ragam ayat, laras bahasa, penulisan perenggan dan gaya penulisan. Di samping itu pelajar akan didedahkan dengan format-format penulisan seperti penulisan literatur, kutipan, bibliografi, abstrak dan penyuntingan.